The Flavel brand embodies style, quality, and beauty, and these lovely Flavel cookers bring all those characteristics to any kitchen. But they are more than mere decorative trophy pieces, Flavel cookers have been created in sleek designs, using top quality materials and manufacturing procedures that you’d expect from the brand. Every Flavel cooker is assembled at a state of the art factory and is tested to ensure that it meets an exhausting array of quality standards before it reaches you. A Flavel cooker is an excellent option for anyone, whether you’re a true gourmand, an established cook, or even if you’re still learning your way around the kitchen. At Currys, we stock an extensive range of Flavel cookers from 4-burner gas hobs, 5-zone ceramic hobs to 9-burner range cookers. 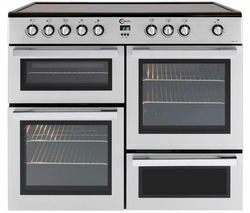 In addition to this, we also stock as many other fine electric cookers from the biggest and best brands including Zanussi, Beko, Logik, Belling, and more. With our diverse selection, we’ll have something to suit any kitchen, from the smallest to the most extensive, so you're sure to find just the cooker for you. With so many models to choose from, you’re sure to find something that suits you perfectly. 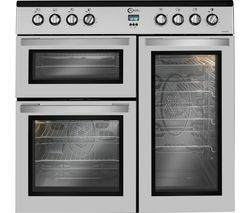 Take a look through our line of Flavel range cookers, to make sure you find exactly what you need. You’ll never regret choosing a Flavel cooker!